Wired communication is a way of allowing two electrical systems to communicate via wires. Each system has the ability to convert a message or data of some sort into voltage. Most commonly this voltage is either the maximum voltage the system has or the minimum voltage the system has. It switches back and forth between these two voltages with respect to time to “send” a message. It is identical in concept to Morse code. Watch the video below. 1. The short sound, the dot, is one-third the length of the long sound, the dash. 2. Each letter or number is a combination of dashes and dots and the time between each part of a letter is equal to a dot. 3. The space between two letters in one word is the length of three dots. 4. The space between two words is the length of seven dots. Below is the “code” for each letter and number. Digital communication systems are generally based around this same concept with a different method for representing each character. In modern systems there aren’t long and short pulses but one length in each system. In place of the long and short pulses are on and off pulses on known length. The most common form of character representation in modern times is called ASCII (pronounced as-kee). In ASCII representation, eight on and/or off pulses are used in a specific order to represent each character. What the video below. 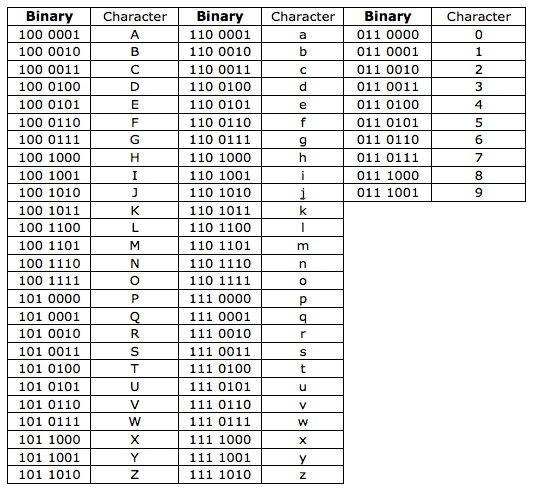 The ASCII table is shown below including both the numbers and letters and their binary representation. Binary refers to a type of number consisting on only ones and zeros. A one represents a high voltage (5V for example) and a zero represents zero voltage or ground. This table is incomplete as ASCII can represent every character on a keyboard. For example the word TECH would be sent as 1010100 1000101 1000011 1001000 and likewise tech (lowercase) would be sent as 1110100 1100101 1100011 1101000. Now that we have a way to use voltage vs. time to represent characters we need a description of how data is packaged together. This way of packaging data is referred to as a protocol. Examples of different protocols are RS232 (common serial DB-9 connector on your PC), Ethernet, USB, Firewire, etc. Wireless communication actually differs very little from wired communication except that it is transmitted using a “carrier frequency.” This carrier frequency is the vehicle that carries the information through the air and to the receiving system. There are two types of wireless communication that are common, analog and digital. For example FM and AM radio are analog transmissions. FM – Frequency Modulation (FM) radio transmissions are transmitted using a “center frequency” along with a range of carrier frequencies. In FM radio, the audio from a microphone is converted into a voltage. FM has a frequency that it transmits that represents a certain voltage (audio level) and voltage above that causes a higher frequency to be broadcast. Likewise, a lower voltage causes a lower frequency to be broad cast. AM – Amplitude Modulation uses one frequency to transmit but at varying amplitudes. Again, the voltage converted from sound is used to alter the amplitude of the carrier frequency. The animation below shows both FM and AM waveforms based on a simple sine wave modulation voltage. This would represent a single tone being transmitted. Digital wireless communications use a similar method but transmit digitally. The range of different methods for digital wireless communication is very vast and advancing quickly. This category includes such things as WiFi, Bluetooth, Zigbee, Cell Phones, Satellite TV, XM Radio, and other proprietary communication methods. When communicating between two systems either through wires or wirelessly, there are two general forms. These forms are Half-Duplex and Full-Duplex. Half-Duplex means that a transceiver (a system capable of transmitting and receiving) cannot receive while transmitting or transmit while receiving. Full-Duplex means that a transceiver can transmit and receive at the same time. When the transmission is done over wires it generally means that a full-duplex system contains two wires. When the transmission is done over a wireless medium it generally means that there are two frequencies being used (frequency division duplexing) or that the systems are taking turns communicating back and forth so fast that you cannot tell they aren’t really doing both at the same time (time division duplexing). See the short animation below. 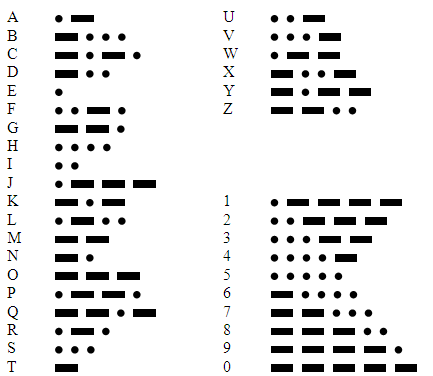 1. Who actually invented the Morse Code used today? 2. In Morse Code, the designer of the code read through a _____________ to determine the most used letters so that the shortest code could be assigned to these letters. 3. If ASCII coding was used to send the message “28,” what would this message look like in binary? 4. If an ASCII code was used to send a message and the receiver received “011001010000010110101” what should this be interpreted as? 5. A partial transmission arrived at a receiver. ASCII coding was used at the received transmission was “1000011 1000001 101010_.” If the last bit was lost what are the possible interpretations of the transmission? 6. FM stands for ___________ ______________. 7. AM stands for ___________ ______________. 8. If a wireless transceiver can transmit and receive at the same time it is said to be ______ _________. 9. If a wireless transceiver must wait to transmit until it is finished receiving it is said to be ______ __________. In question #5, both the first and third term have only 6 digits worth of information (100001 1000001 101010). Was this purposeful? Yes and no, the first set should contain 7 bits, the last set should contain 6 as the 7th was “lost.” I’ve corrected it above… Thanks for the heads-up!